Visual media isn’t exactly my strong point, hence the logo contest. Some people have an inexplicable eye for photography. They understand angles and can take an unbelievable shot with a disposable camera; I am not one of those people. I’ve visited some of the most beautiful places in the world and explored adventures to the extreme, though, so I’ve managed to capture hundreds of great moments on video and in photos. From North America to Oceania, from whitewater rafting to skydiving, you can see the world through our lenses at the Bucket List Publications Gallery. Did you ever see an ocean that was such an unbelievable blue that you were unsure if you were actually awake or asleep? I can show you that dream in Fiji. Have you ever seen the pages of ancient history unfold before your eyes? You can with my photos of Europe. Travel around the world in just a few short minutes or take your time and explore; you can see it all in less than an hour. Indulge in the adventure of travel and new experiences at Bucket List Publications. Can you identify where the photos were taken? Make your guess by commenting next to the pictures. Even though you know the country, do you really know the area? Lets test your travel knowledge. This entry was posted in Uncategorized and tagged bucket list, Bucket List Publications, bucketlist, photo, photography, travel, vacation, video, videos by lesleycarter. Bookmark the permalink. Visual isn’t mine either so I started asking people with graphic experience for my quotes you may try the same. Photos are just photos that do not perhaps mean fun too some. Me either. But I like what you are doing. Shows a lot of respect for your customers and I might look you up one day too for an east coast guide. Been sometime since I was there. Hey! I had another idea for your logo. I am creative but sometimes struggle to draw/visualize it :). I noticed you used the word lenses quite a bit in the above post….and it got me thinking. It would be neat if your logo was a pair of hipster ray bans (with the frames grey) and the lenses a reflection of pictures you’ve taken on your travels – do you know what I mean?? And the pictures would be in color. Do you know what I mean? I think that could be so cool….. I LOVE that you experienced a shade of ocean blue that made you question whether you were awake or asleep – that is Inspirational!!!!!!!!! Stopping here is an education every time. 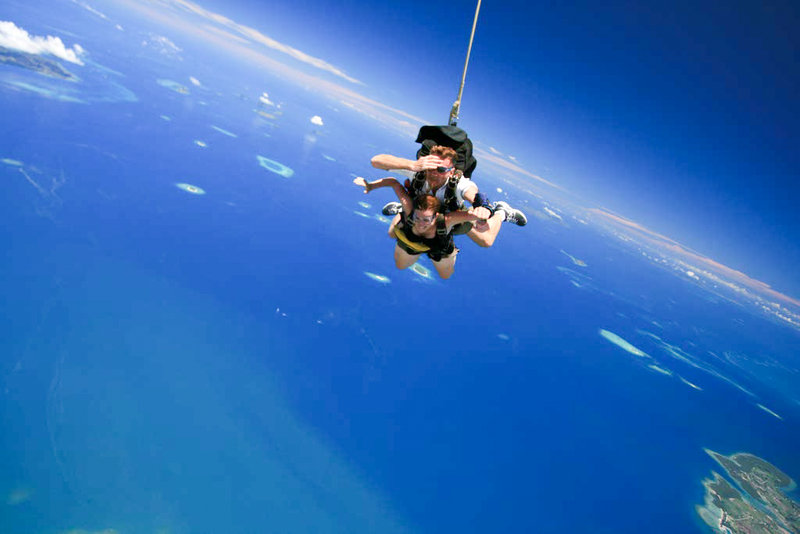 I SO want to skydive but SO afraid!! I do see the world through your lense…and what a wonderful world it is. Thanks for taking us all along with you. Thanks Lesley, that was a sweet comment. Sums up why I read your blog and similar, too see the world through the lenses of the photographers and bloggers. There is not a shred of doubt that I would never do the things you have done. I would like to fly, but it would have to be a very large jet and I would not want a window seat. I would have to pretend I was riding in a very large bus. That said, I love your photos, even the ones that make me hyperventilate and make me want to kiss the ground. A boat (also very large) would be more my style to go from country to country and see the world. I love all of the interesting places I visit and exciting things I do through you! Thanks for sharing your experiences! Yout experience looks so much and whay a thrill it must have been. I believe Leonardo da Vinci was saying one can experience flight even without even being there up in the sky. He was aware and had to hide his words of what was the real intent. I can from my home if s person is sick. All I need is a picture a focus point. The quote of Da Vinci is one of the most used and most cliché, but so true! I used it as starting point for Apron6. I invite you to hang with me in the Shenandoah mountains for two nights in the spring. Hikes, dual blog and fun. Let me know. I just read about the sights you visited in Atlanta. WOW Things have changed. I lived there from about 1970 until 1979. If the fact that you see your life flashing with the most important memories before your eyes is true, i think you would win an Oscar. Amazing photography, and i can only dream of having these kind of experience you had. Well done! Fantastic. It is my usual dream. The view though your lense was amazing! I will say this is not on my bucket list but, I am grateful for those non-chicken adventurers like yourself who just go for it :).